The question is— How do you get almost any imaginable sound out of a guitar with a single pickup? Doug Wilkes has ‘The Answer ‘. Doug Wilkes has been making The Answer for over 20 years now, and has a world wide patent on the design. 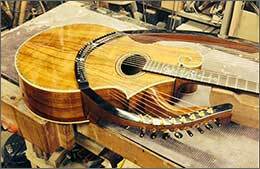 If you are looking to find a guitar that has every sound imaginable, and built in a totally bespoke style that adheres to your every detail, then contact Doug to arrange a visit to his work shop. You may be suprised that The Answer is not as expensive as you might think…! 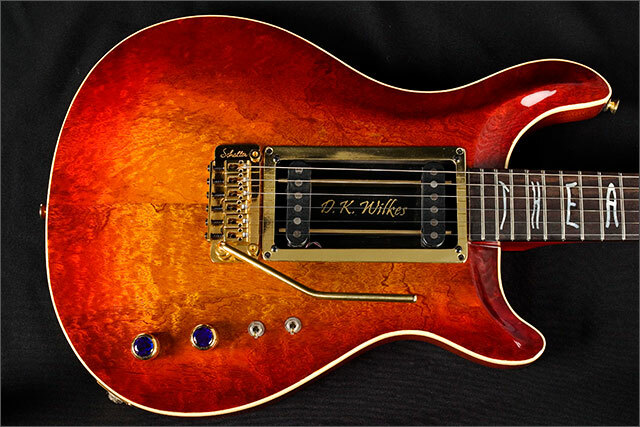 Keep visiting wilkesguitars.co.uk to see the development of the new Answer model 2009. We’ll be adding more details, pictures and also a video demo of the guitars capabilities soon..! A review by Neville Marten of Guitarist Magazine, July 1985. When I was told that Doug Wilkes of Wilkes Guitars, had developed this instrument, I was, to say the least, skeptical, much so so that I braved the terrors of travelling the M1 to go and see for myself. 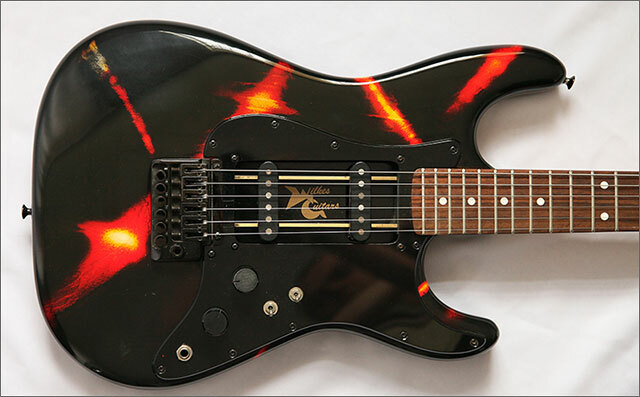 Upon arrival I was shown a Stratocaster style guitar with a single, open topped humbucker, on rails. My initial reaction was to think that it was another Dan Armstrong style, sliding pickup guitar, which was a great instrument, but didn’t catch on, and that it couldn’t possibly do what Doug had said. Then he showed me how it worked. The ‘single’ humbucker is, in fact, split into two halves which BOTH slide up and down the rails, independent of each other. 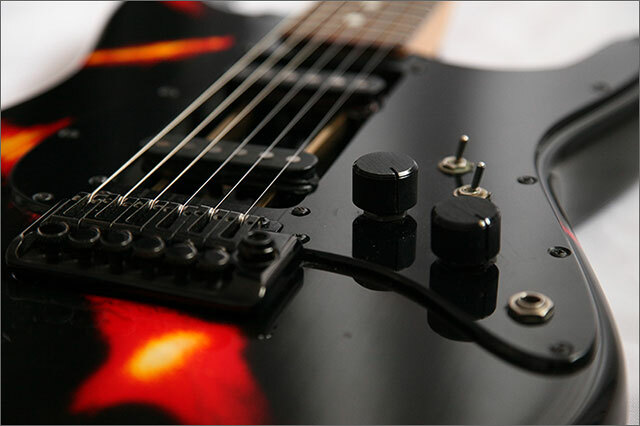 This means that you can have the pickups in any position or combination of positions conceivable. I plugged into Doug’s Music-Man amp and immediately saw the potential. You can get all the single coil Strat and Tele sounds straight away, plus those of your favorite humbucker. Of course, because the positions are limitless, there are also many other subtle variations never before accessible. 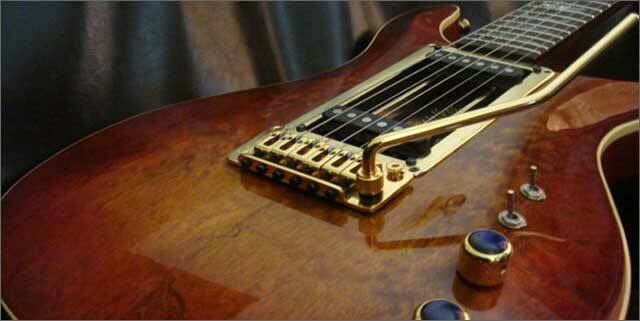 The only commonly used sound not available is that of twin humbucking pickups together — and for obvious reasons. There are master volume and tone controls, plus a couple of mini toggle switches. The switches give combinations of one or both pickups at a time, in series or parallel. I won’t go into detail on the switching arrangement as it is being altered slightly to make life a little easier for the user. The pickups grip the rails quite firmly, until a small amount of downward pressure 30 is applied. They then free themselves and slide easily back and forth to where you want them. There are actually two models of The Answer available; the single pickup version and another, with three single coil pickups very much in the Strat style but with a tone combination that is mind boggling (you still can’t get those twin humbuckers, though). Doug reckons there are twenty seven preset sounds before the pickups have been moved or the tone controls even touched. I was a bit over-awed by this one, so I concentrated on the ‘single’ pickup model. It put me in mind of when Robbie Gladwell and I worked for Gibson. He built himself a Les Paul with 3, P90 pickups on it — sort of a Stratocaster Les Paul. He fitted it with a switching system which allowed him the twenty seven options and talked of how he could now get all the sounds he would ever need. We all joked and called it his IBM guitar, because it was less like a guitar than a computer. He demanded that we go and see him use it on a gig, so the whole Gibson guitar repair team duly turned up to see the spectacle! Needless to say, the poor chap fumbled around in the dark, didn’t find a decent sound all night and sold the guitar the following week! Because the system is so new and different, Doug has gone to the extent of patenting his innovation. At this moment he is liaising with the renowned Schaller Company, in Germany, to have the units built there and things are looking very good. The idea is that ‘The Answer’, which is the name of the system rather than the guitar, will be available as an add on extra for anyone who wants to build it into his, or her own instrument. On a Squire or a Tokai, which Doug sees as the likely home of the majority of units, all that would need doing is to remove the wood between the front and back pickups — a fairly simple job to do yourself and not too expensive if done by a professional. ‘The Answer’ will be mounted on its own scratch plate and would simply replace the original module. This is a simple, but brilliant idea which really works. At the time of writing, Doug does not have a fixed price for the unit as negotiations were still taking place with Schaller, but the hope is that it can be held below the £100.00 mark. I have never been one for new fangled gadgets or gimmicks, but I was really knocked out with this clever little device. It would make an ideal recording guitar as you would be able to use one instrument that you were really at home with and obtain just about any sound demanded of you. 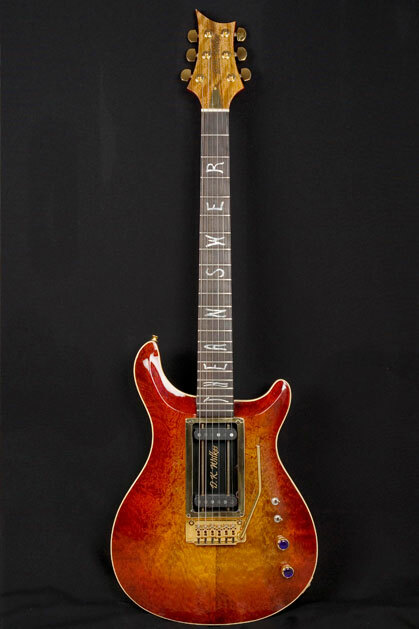 It would be nice if Doug Wilkes could persuade one of the big companies to fit ‘The Answer’ to one of their guitars, possibly as an option. I like it. I hope he makes a fortune! So who plays The Answer..? Many guitarists have played the answer over the years. Doug has supplied many big recording studios worldwide with an Answer guitar to enable artists to get any sound when in the recording process. Famous guitarists include David Gilmour who owns more than one Answer and recorded 2 Pink Floyd albums with The Answer, Tim Renwick, Big Country played The Answer at a studio in London and as a result rang Doug to say how amazed the were by it and ordered 4 guitars..! Contact Doug to commission him to build you a custom build ‘Answer’ guitar. Any colour, any style, whatever you want… you can have…within reason…! Doug has built an incredible amount of instruments over the last 30 years.